TJ Rear Bumper Brace Kit for Jeep Wrangler TJ 1997-2006. The Poison Spyder Jeep TJ Rear Bumper Brace Kit adds more strength to your TJ rear bumper mounting. This is especially Important if you intend to tow, use bumper-mounted recovery points, or a bumper-mounted spare tire carrier. This is a recommended upgrade for all Poison Spyder TJ rear bumpers, including the RockBrawler and BFH line of rear bumpers. The braces are CNC laser cut and precision brake-formed from 3/16 inch plate steel. They include a strengthening gusset to provide additional strength over competitors non-gussetted braces. There is an access hole conveniently placed in the center of the gusset for a socket to reach the rear body mount nut, if needed. 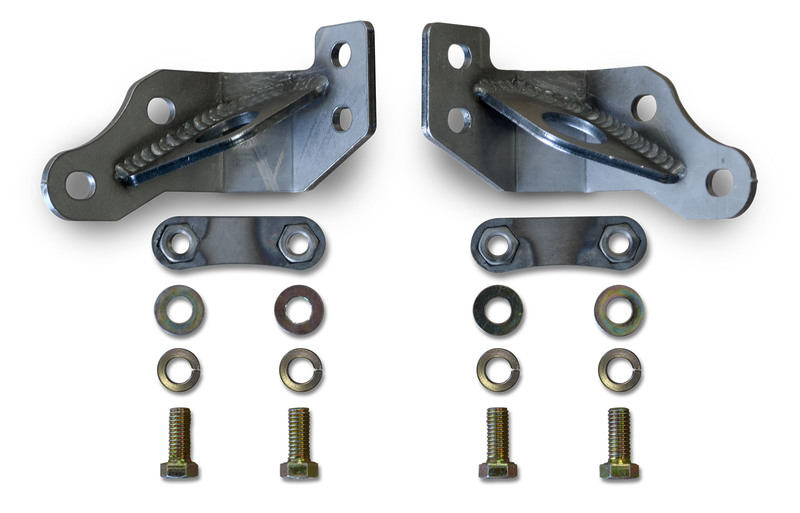 Nut plates with both nuts welded to a single plate to simplify installation are supplied, which are inserted inside the frame rail so that the supplied Grade 8 hardware securely clamps the wall of the Jeep frame rail. The TJ Rear Bumper Braces and Nut Plates are bare steel, and will need to be painted or powdercoated prior to final installation. This product ships as bare steel it will need to be painted or powdercoated prior to final installation. We do Not offer a powdercoat option for this item.